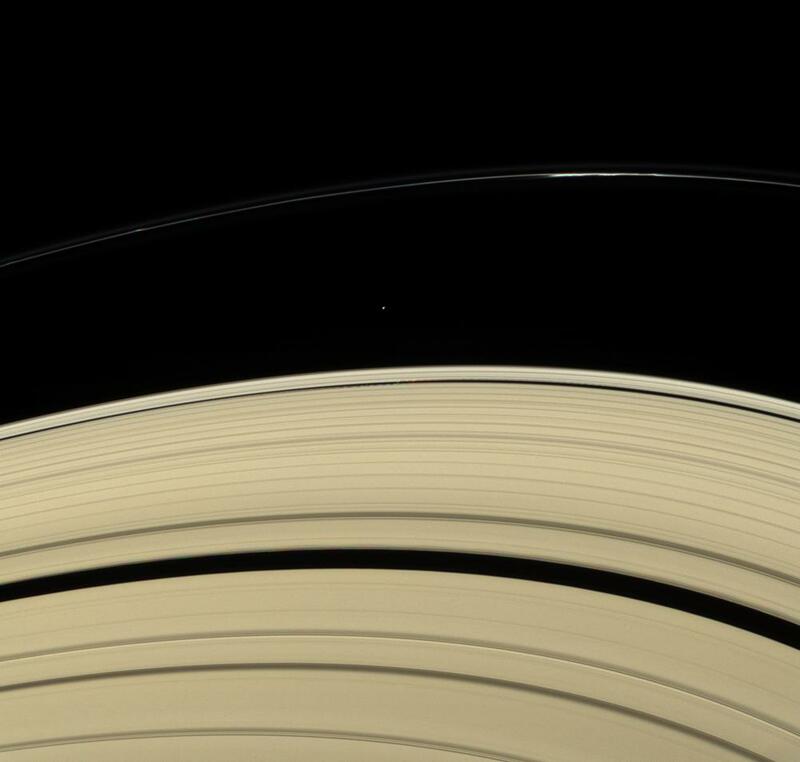 Across the expanse of Saturn's rings, the Cassini spacecraft spies two small moons in consort. Atlas (32 kilometers, or 20 miles across) is seen exterior to the bright outer edge of the A ring. Daphnis (7 kilometers, or 4.3 miles across), below Atlas in this view, orbits Saturn within the narrow Keeler Gap. The presence of Daphnis is revealed by the waves it raises in the ring material surrounding it on the edges of the gap. Daphnis and its waves moved between exposures taken to create this color view, resulting in their slight displacement in each color. This view looks toward the unilluminated side of the rings from about 18 degrees above the ringplane. Bright clumps are visible in the narrow F ring. Images taken using red, green and blue spectral filters were combined to create this natural color view. The images were acquired with the Cassini spacecraft narrow-angle camera on April 13, 2007 at a distance of approximately 1.8 million kilometers (1.1 million miles) from Atlas. Image scale is 11 kilometers (7 miles) per pixel.